A restaurant’s atmosphere can make or break the moment. The experience of dining is just as important as the food offered. Those moments can be accentuated by being able to observe natural beauty or city skylines of the region you may be visiting. And, these restaurants have just the view that pair well with the fare offered. There’s nothing like fresh, local salmon while enjoying a view. Look out of the windows and you’ll see the Purcell, Selkirk, and Rocky Mountains. It’s a 15-minute gondola lift ride to the 7,700 feet above sea level restaurant. You’ll need to buy an extra pass in order to get to there. The Pitons and the Caribbean Sea are at your eyes’ pleasure at Ladera Resorts’ Dasheen restaurant. The old cocoa plantation turned resort offers great local dishes such as Caribbean lamb salad or coconut and potato soup. Island farmers and nearby plantations grow produce primarily for the resort. It is the only resort in St. Lucia located on the UNESCO World Heritage Site. The Sanctuary Lodge Hotel is the closest hotel to Machu Picchu. While enjoying a traditional Peruvian meal you’ll be overlooking the Sacred Valley, Urubamba River, and Machu Picchu. Plus, the lodge gets its produce from its own plot of land. The Eiffel Tower is impressive from the outside. It is even more impressive from the inside…when you’re eating a French dish on the second floor of it. Sightseeing is on a whole new level at Le Jules Verne; overlooking Paris. Enjoy a beer on the sun terrace at Hotel Edelweiss. The view over looks the Eiger, Mönch and Jungfrau Summits–also known as the big three of the Swiss Alps. It is convenient to ski slopes and hiking trails if you want to burn those beer calories off. If you’re not terrified of heights then head to the Vertigo Rooftop Bar. It is an uncovered bar on the 61st floor rooftop. While you’re eating roasted snow fish or wagyu take in the views of the business district, river and the city skyline. The Peninsula Hotel is Hong Kong’s oldest hotel. And, for more than 85 years, it has been legendary for its culinary ventures. To bring back the moments of yesteryear, the hotel offers things like Afternoon Tea in the Lobby. The Felix restaurant overlooks the Hong Kong skyline and the harbor. The split-level setting of La View Restaurant in the Kupu Kupu Barong Resort is a great place for taking that special someone. The cuisine “transcends South East Asia with a distinct French infusion”. The view of the Aunug River and forest joins you for a lovely lunch or dinner. Even though Labasin Falls is a spillway of the Labasin Dam and not a natural waterfall, it still offers an interesting view. The resort was once a coconut plantation built by Don Placido Escudero and his wife Dona Claudia Marasigan in the 1900s. Their son, Don Arsenio Escudero built the first hydroelectric plant to supply the coconut factory. Hence, the fake waterfall. Plus, it’s an all you can eat buffet. At the edge of Kuka Hills sits Klein’s Camp. The vast Serengeti plains offers visitors a chance to view the wildlife Africa has to offer. From your private lodge you can see the Serengeti National Park and the Masai Mara National Reserve. Eating on a rock never sounded so appealing. At the Rock Restaurant you’re just off Michanwi Pingwe beach with the Indian Ocean surrounding you. The menu boasts a lot of seafood and that seafood is fresh. At 36 levels above the rocks at Sydney, you’re sure to see some great sights. The Blu Bar on 36 gives guests panoramic views of Sydney Harbour Bridge, Opera House and Darling Harbour. If you feel like spoiling yourself, get the $10,000 dollar martini. It comes with a room. That’s always reassuring. High at the top of Bob’s peak sits Queenstown’s Skyline Restaurant. The Gondola ride to the restaurant is the steepest cable car in the Southern Hemisphere. Once at there enjoy the panoramic views of Lake Wakatipu, Coronet Peak, The Remarkables, Walter Peak, Cecil Peak, and all of Queenstown. Order yourself a martini shaken, not stirred at Piz Gloria. This is where the 1969 James Bond 007 film, “On Her Majesty’s Secret Service”, was filmed. 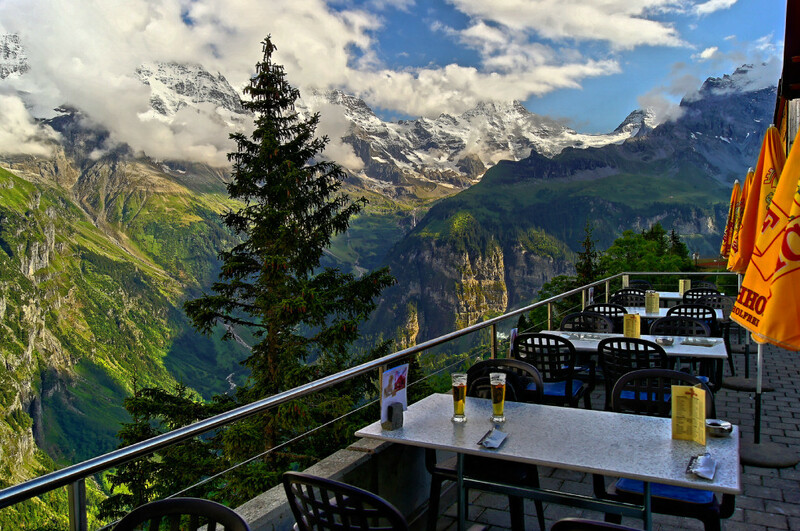 While dining you’re looking at over 200 summits including the Piz Gloria, the Eiger, Mönch, and Jungfrau peaks. The Palazzo Avino Hotel sits on what was once a medieval fishing village on the Amalfi coast. While you’re enjoying the two-star Michelin Italian fare you will be looking over the Mediterranean Sea and other fishing villages. Also, the regional wine is paired perfectly with the cuisine. What about the restaurant 360 on top of the CN tower in Toronto, Canada?